forget lakes. we got bikes. Minneapolis is pretty widely known as a bike-friendly city. But you should see our working “bike facts” document; all the information is a little overwhelming. Did you know there’s a Twin Cities Bicycling Club? And unicycle club? That the new bike share program, Nice Ride MN, starts in May? Or how about that Minneapolis is home to America’s first bike freeway, Cedar Lake Trail? As much as we wanted to share everything we learned, we decided to boil it down into six key sections. Michelle compiled all the the info and then decided which parts Peter and I would design. Before breaking from our meeting at Wild Roast, we settled on colors and typefaces so that when the pieces came together, we wouldn’t have to do a ton of work. And the plan worked! After changing the orientation of a few sections and figuring out a way condense two pieces of information, we were mostly set. Hope you like it! And maybe learn something new about the community we call home. 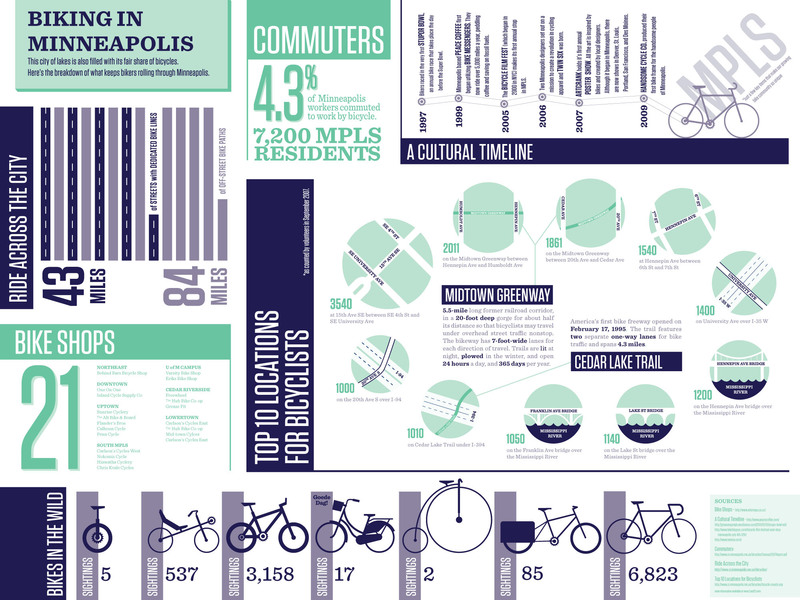 Awesome Edward Tufte-like graphic of the bike scene in Mpls.! and good luck in the competition. Nice work ~ Beautiious indeed! That makes me proud to live here.